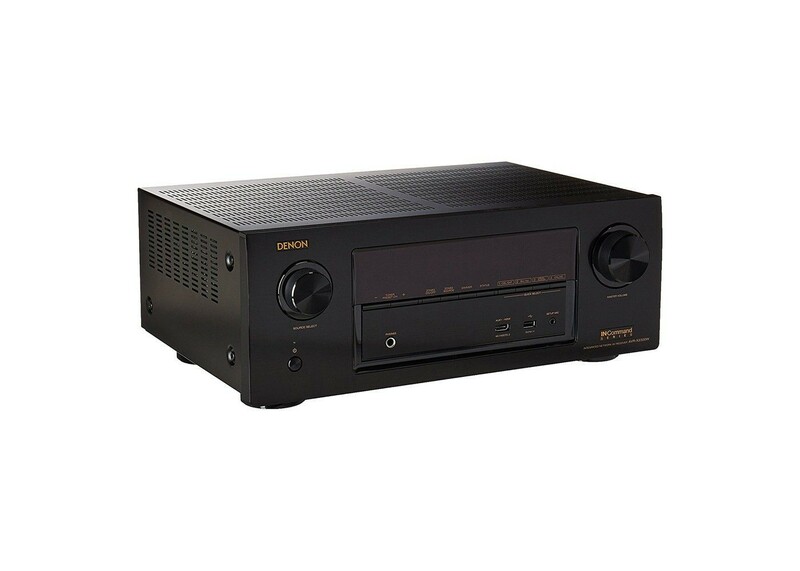 Featuring high current discrete power output devices on all seven channels, the AVR-X2300W is rated at 95 watts per channel. It’s also equipped with high-current low impedance drive capability, for compatibility with the widest range of loudspeaker models (down to 4 ohms). The ECO mode adjusts the power amplifier’s output according to the volume level to reduce power consumption, with an on-screen ECO meter providing real-time monitoring of the power-saving. Featuring Bluetooth and Wi-Fi wireless streaming connectivity, the AVR-X2300W is equipped with an advanced dual antenna system for robust and error-free streaming even in congested urban environments. Connected to the Internet through your home Wi-Fi network (or with a hard-wired connection via the RJ-45 Ethernet LAN port), it allows you to enjoy your favorite tracks from streaming music services such as Spotify Connect, Pandora, and SiriusXM. You can also choose from thousands of Internet radio stations from around the world, and enjoy music and speech entertainment of virtually every genre. AirPlay lets you play your favorite tracks wirelessly from your iPod touch, iPhone or iPad, and via network streaming you can listen to music files stored on your home PC or Mac, or NAS devices. The all-new Denon 2016 AVR Remote App lets you control the AVR-X2300W with your smartphone or tablet over a network connection: it’s available for both Apple iOS and Android devices. Dolby’s revolutionary Dolby Atmos technology dispenses with the channel-based surround sound coding used for decades, in favor of advanced object-based coding, giving the sound designer the ability to place sounds precisely anywhere in the three-dimensional soundspace. Now you can enjoy this award-winning technology at home with the AVR-X2300W, which features the ability to connect a 5.1 surround sound speaker system and 2 additional overhead speakers or 2 additional Dolby Atmos elevation speakers for the ultimate home theater experience. DTS:X: The latest immersive surround sound system, DTS:X features similar object-based audio coding, and provides for overhead speakers to deliver a stunning surround sound experience. (DTS:X will be enabled via future firmware update: for more info, please visit www.denon.com/dtsx). This includes both Dolby Surround and DTS Neural:X upmixing: users with a ‘3D’ sound speaker set-up are able to get an enhanced surround experience from conventional Dolby- or DTS-encoded content, or even music in stereo, using the full set of speakers installed in the listening room. With no fewer than eight HDMI inputs (including one conveniently located on the front panel), along with dual HDMI outputs, the AVR-X2300W’s advanced video section features the latest HDMI specifications, including 4K Ultra HD 60Hz video, 4:4:4 Pure Color sub-sampling, High Dynamic Range (HDR) and 21:9 video, 3D, and BT.2020 pass-through support on every input. The AVR-X2300W also features HDCP 2.2 compatibility, a requirement for 4K Ultra HD copy-protected content, ensuring ready for the next generation of Blu-ray disc players, set-top boxes and other 4K Ultra HD sources. In addition, the video processor can also upscale digital SD and HD video to 4K Ultra HD. Certified by the Imaging Science Foundation, the AVR-X2300W features a full suite of video calibration controls (for use by an ISF technician), along with ISF Day and ISF Night video modes. Discover the incredible fidelity of high resolution audio tracks with the AVR-X2300W’s ability to decode up to 24-bit/192-kHz lossless files (AIFF, FLAC and WAV; ALAC/Apple Lossless to 24-bit/96kHz), as well as DSD 2.8MHz (the audiophile format of SACD) and now 5.6MHz. Play them from memory devices via the front panel USB, or from network sources – the AVR-X2300W will also play lossy file types such as MP3. As the first AV receiver manufacturer to embrace Audyssey’s advanced DSP audio algorithms, Denon brings to the AVR-X2300W the Audyssey Silver suite of DSP functions, which includes MultEQ XT, Dynamic EQ and Dynamic Volume. Audyssey MultEQ XT automatic room acoustic measurement and correction system uses the supplied microphone and a test-tone sequence to match your speakers to your room’s acoustics, giving the smoothest, most natural tonal balance. The MultEQ XT system here provides greater filter precision for the main and satellite speakers, with eight times the resolution of the base MultEQ system, for up to 8 measurement locations to ensure the best sound for the whole family, not just one ideal ‘sweet spot’. Audyssey Dynamic EQ uses advanced psychoacoustic algorithms to continually adjust tonal balance to deliver full range sound, even at lower volume levels; Audyssey Dynamic Volume smoothes out those annoying volume jumps – especially from loud commercials – for an easier viewing experience. The AVR-X2300W’s clear, easy to understand graphical on-screen display guides you through the setup process to ensure the correct configuration. The exclusive Setup Assistant and the included Quick Start guide together provide easy setup instructions, leading the user step by step to optimize critical settings for the best possible sound and video quality with the rest of your system.